Think turbulence is bad on a 767? Imagine soaring through the skies with nothing but a prop engine between your legs or a couple of jets strapped to your back. These are the 10 smallest manned aircraft that have ever seen flight—whether they were good ideas or not. Though the project never completely got off the ground (get it? ), four prototypes were built and the aircraft took its first flight in 1980. Propelled by two Microturbo TS 18 turbojets, and only about 22 feet in length, the Microjet 200 is very much on the smaller side of the jet aircraft spectrum. The Ikarus 451M was a Yugoslavian-designed and built jet aircraft created mainly for cockpit ergonomic design and research purposes. But that surely didn’t stop its designers and engineers from using similar variations of the aircraft from using it for other purposes. Like world speed record attempts. Specially a 466 MPH air speed record. Over 450 MPH in something that small? It’s only 24 feet and 5 inches long with a wingspan of just above 22 feet. Hell no! The Gee Bee Model R was an aircraft developed solely for racing purposes. In 1932 it was capable of reaching “landplane” record speeds of up to 296 MPH, but only with a skilled pilot at the helm. Other times, its flights didn’t go so well. The Model R was crashed three times, twice fatal. These accidents were mainly due to poor stability, confusing controls, and an unbalanced design. Its length was just under 18 feet and its wingspan 25 feet across. The McDonnell XF-85 was designed by the U.S. Air Force toward the end of WWII. The plan for the XF-85 was that it could be deployed from another already inflight military aircraft, thus extending the fighting “range” of war planes like the XB-35 or B36. Of course, to be stuffed into another plane, it had to not only be deadly but also extremely compact. The XF-85 prototypes were just under 15 feet in length and carried a wingspan of about 21 feet. The XF-85 parasite aircraft program was cancelled after it was deemed that it lacked performance capability compared to some of the more popular jet fighters of the time. Does the Cri-Cri look like something that could’ve been designed and built in a backyard? That’s because it was basically designed and built in a backyard. Though maybe not the most impressive airplane on this list by speed or range, the Cri-Cri does beat many of the others in size. Its length covers only about 13 feet and its wingspan about 16 feet. It’s tiny! Known to the record books as the “world’s smallest monoplane,” the DS-1 is indeed pretty tiny. In fact, it was designed almost solely to hold the record. Not to say it can’t handle some real flight time as well. Thirty-five flights were successfully piloted by retired Navy pilot Harold Nemer, which is a bit more than some of the other tiny aircraft on this list can claim. And they’re not the ones with a wingspan of about six feet or an overall length of just 11 feet. Nope. As a gyrocopter, the Bensen B-8 isn’t really required to have an annoying enclosed cabin or the other necessary things that usually go into airplane design. In fact, the B-8 is so plain that it’s pretty much just a motor, a frame, a seat, a motor and a rotor. Let’s face it, is everything else really even necessary? The B-8 Gyrocopter is just over 11 feet in length. Feel free to take a spin. What could possibly go wrong? In 1952, the Stits SA-2A Sky Baby attempted to rule the skies as the world’s smallest airplane. After dialing in just 25 hours of flight time, the aircraft was retired. I guess to set a record like that, you really only need to fly it once. What really matters is the size: 10 feet long and a wing span of just over seven feet. In an attempt to break his own record, Robert Starr had built the Bumble Bee II. It was a follow up to the original Bumble Bee, with which Starr locked down the Guinness smallest biplane record. On Starr’s attempt to break that record, the airplane’s engine cut out mid-flight, causing a crash that left Starr severely injured and the almost nine-foot long airplane nearly destroyed. Ouch. 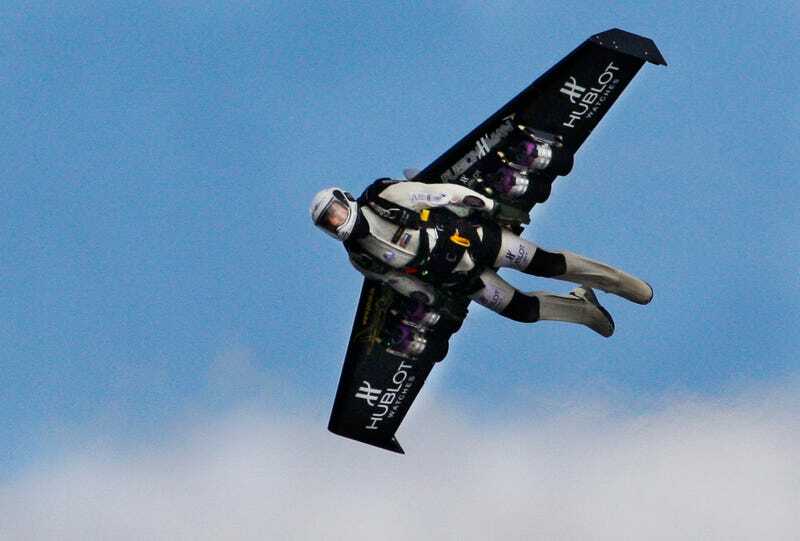 As an attempt to expand on recreational free-falling and sky surfing, pilot Yves Rossy developed this contraption. Four jet motors on a half foot wide wing, strapped on a pilot’s back, with the ability to fly up to 13 minutes. This guy has flown across over the Alps with this thing. The Alps! It’s a flying machine that you could probably carry in the trunk of your car. What a time to be alive.